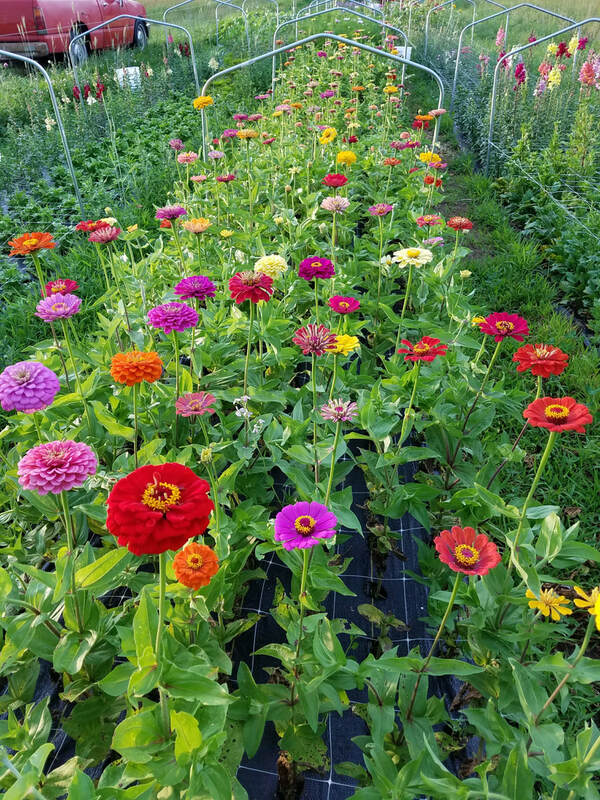 In 2017 we began growing cut flowers for our farmers market and florists sales. Our flowers are all grown by us on our farm. We raise over 75 varieties of flowers including annuals and perennials. We pick the flowers every day to encourage more stems and freshness. They are stored in our cooler in fresh water and a splash of bleach to discourage bacteria and give the flowers a longer life. Our market bouquets are a unique style of cultivated and wild flowers you won't find anywhere else. All season long we pick and store flowers to dry for making into dried floral wreaths and swags. Order bulk flowers: Maybe you would like to do your own floral work for a special event, or as a group activity. We are not able to deliver, you must pick up at the farm. One bucket includes 50-60 stems of blooms and foliage. Please give us 2 weeks notice before your event. Price includes a $5 deposit each bucket. We are currently predicting about 3 buckets available each week from July-September. Special order: This is a market style bouquet for delivery in Waupaca or for pick up at the farm. Includes a glass jar or vase. Contact us for this option. During the months of July, August and September we bring fresh bouquets to the market. The Waupaca Farm Market takes place every Saturday, May-October from 9-2 at the corner of Main Street and Fulton. Turners Farm Market also sells our bouquets on consignment. We deliver fresh bouquets on Friday mornings, July-September.